Keenly intelligent and brilliantly rendered, The Golden Mean is a bold reimagining of one of history’s most intriguing relationships—that between the legendary philosopher Aristotle and his most famous pupil, Alexander the Great. Aristotle is initially reluctant to set aside his own ambitions in order to tutor the rebellious son of his boyhood friend, Philip of Macedon. Still, the philosopher soon realizes that teaching this charming, surprising, and sometimes horrifying teenager is a necessity amid the ever more sinister intrigues of Philip’s court. But as Alexander grows older and becomes a man who will transform the world for better or for worse, Aristotle, like any teacher, ponders his own culpability. Annabel Lyon’s story collection, Oxygen, and book of novellas, The Best Thing for You, were published in Canada to wide acclaim. 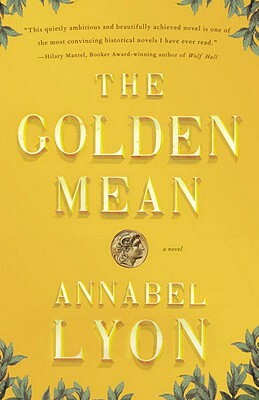 The Golden Mean, her first novel, is a Canadian bestseller and is being published in six languages. It won the Rogers Writers’ Trust Fiction Prize and was nominated for the Scotiabank Giller Prize, the Governor General’s Award for Fiction, and the commonwealth Writers’ Prize. Lyon lives in British Columbia with her husband and two children.